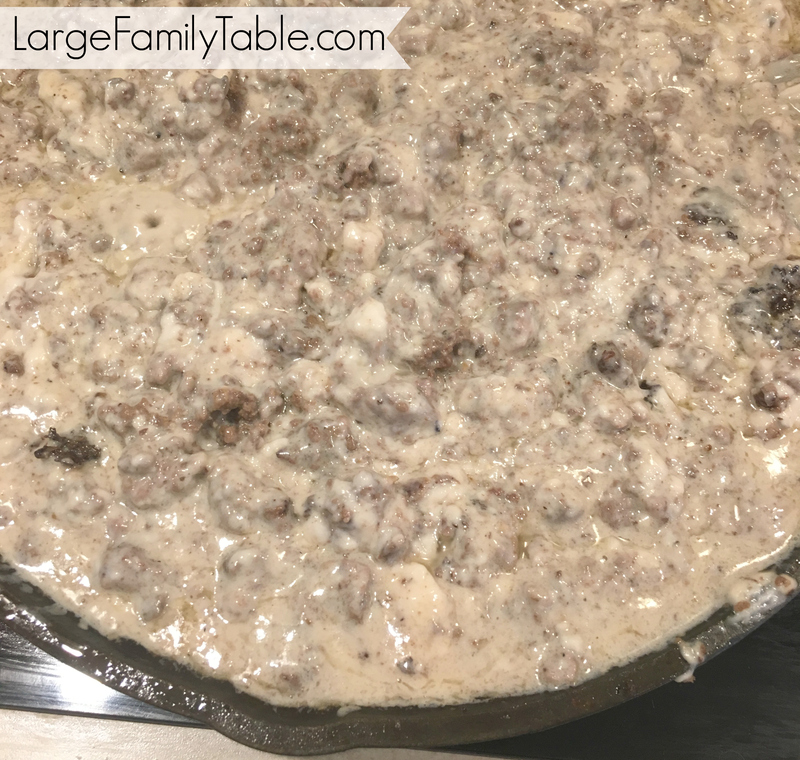 Today, I am talking about how to make sausage gravy on the stove-top. We eat this gravy over my yummy, extra-large homemade biscuits. But if I didn’t have time to make them, I would happily open a few cans of biscuits. If you want to know how I make my biscuits, you can see my homemade biscuit recipe here. My pans of gravy start out very small, and then they grow as I add more to make them the right size for our large and growing family. Don’t forget – I am feeding a family of 9, with a hubby who stands 6’6, and 2 strapping teen boys. I wasn’t sure how far these 2 pans of gravy would stretch, and as it turns out, they were both gone by Saturday and I made them on Thursday night. These people can eat! 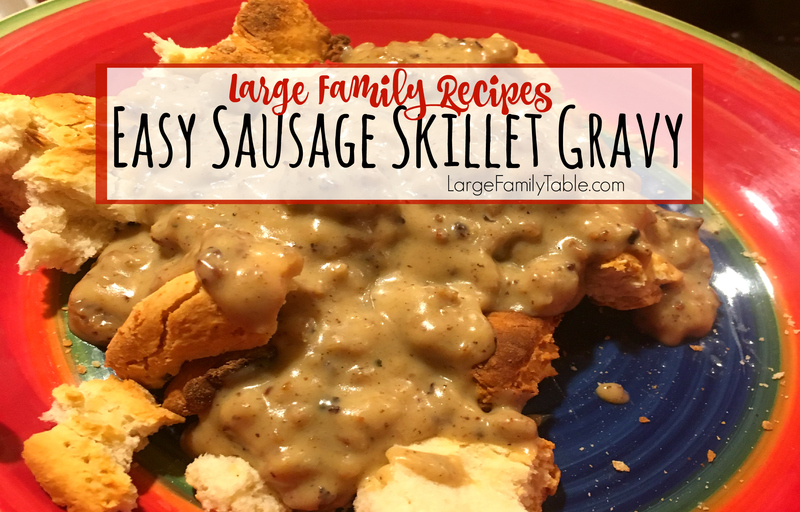 Okay, let’s get started on this Easy Sausage Skillet Gravy. Brown sausage in pan on stove-top. Begin by adding 1/4 flour, and stir until the sausage is coated. Add 3 1/2 cups of milk, and stir. Continue adding flour (1/4 cup at a time), and milk (1 cup increments) until you have the gravy as thick as you like and the amount you want. I ended up using a total of 1 cup of flour and 9 cups of milk. Stir, stir, stir to get your gravy to the perfect consistency! Now you see what I mean, don’t you? I began with such small amounts of flour and milk, only to have very full pans of gravy by the time I was done. This is true comfort food, and it’s so easy to make that I can’t complain. Keep in mind that it takes some serious babysitting while it is cooking (and growing! ), but that is just stirring and adding. And stirring and adding. Don’t plan to wash the dirty dishes while your gravy is cooking. It will require your full attention for the 10-15 minutes that it is growing. This meal is perfect for those cold, windy days of winter. But it is perfectly suitable for anytime of year if you have a houseful of gravy lovers like I do! I hope you love it as much as we do. Be sure to tell me in the comments if you try it. 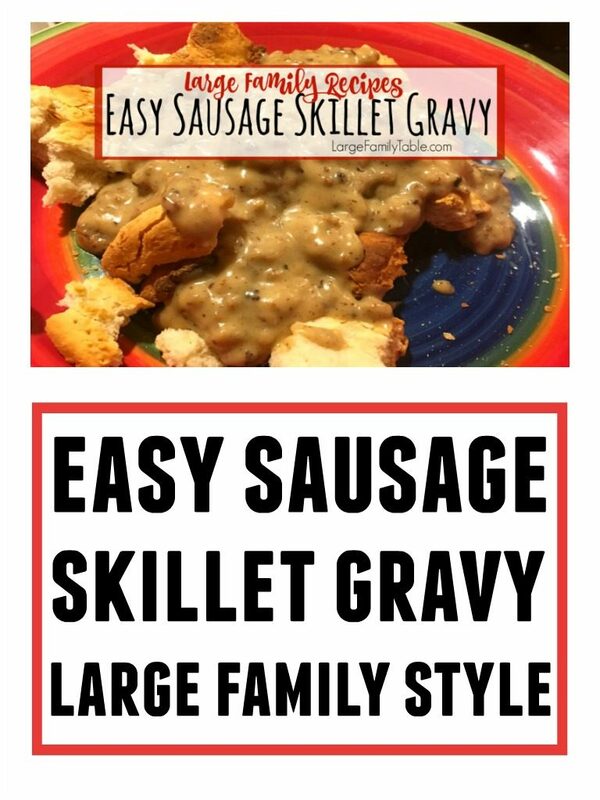 Click here to watch the full Easy Sausage Skillet Gravy Recipe Video! Hi, I have a KitchenAid stand mixer just like yours. I noticed on the biscuits video on YouTube you didn’t lock the bowl down. It locks into place so it doesn’t move around. These mixers can be dangerous if not used properly and I don’t want you or anyone else in your house to get hurt. Please read the instructions before you use your mixer again. This is not criticism, I’m just trying to help. BTW, I love your videos, both the cooking and shopping. I love to cook, maybe we could share recipes. Glad I came across this again. I know what I am making next Sunday morning for my bunch 🙂 Thank JaMerrill.